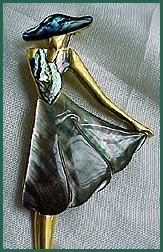 Figural Sale - Mother of Pearl Vintage Lady Pin! "Gorgeous" definitely has an attitude, that of one of the 40's and 50's. She is not that old but her style is! Set in goldtone metal she is a beauty!